Given to Ellen Ballon by her teacher, Rubin Goldmark. 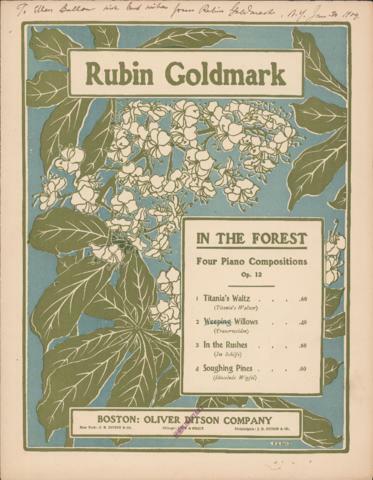 Rubin Goldmark was an American composer, pianist, and teacher. Although his works were frequently performed during his lifetime, he is better known today as the teacher of Aaron Copland and George Gershwin. Born in New York City, he completed his undergraduate degree at City College in New York before moving to Austria to attend the Vienna Conservatory. He then returned to the United States whre he taught at the National Conservatory. At this time, he also studied piano with Antonin Dvorak and piano with Rafael Joseffy. Apart from a brief stay in Colorado Springs, when he was the director of the Colorado Conservatory of Music (1895-1901), he spent the rest of his life in New York. This work is in the public domain in Canada. Please obey the copyright laws of your country. It is your sole responsibility to verify whether the file available for download and viewing is in the public domain in your country or if downloading a copy constitutes fair use. Description created by Rebecca Shaw on February 21, 2018.